It’s cold and blustery in Juneau. We have some snow on the ground and the Taku winds are howling. Time to make soup. Due to the time of year, and the fact that I had one sitting around, an Acorn squash soup seemed like the right thing to make. So, I picked up another one and some fresh sage while I was out and about. Bret happens to hate the texture of Acorn squash, so a pureed soup seemed the only possible option. Preheat oven to 400 degrees. Cut the acorn squash in half and scoop out the “guts”. Lay on a baking sheet skin side down. Peel and quarter the sweet potatoes. Quarter them and add them to the baking sheet. Drizzle with olive oil and sprinkle with salt and pepper. Put the cookie sheet in the oven and roast for an hour or until the squash and the sweet potatoes are soft. When those are getting close to being done, chop the onion, garlic, celery and sage and saute in olive oil over low heat until onions are translucent and zucchini is soft and lighter in color. Turn off the heat. Remove the squash and potatoes from the oven. Warm up your stock. When it’s warmed up, puree the sweet potatoes with the onions etc. and a cup or so of vegetable stock in a food processor. Put it into the soup pot. Once the squash is cooled enough to remove the skins, do so. Now, puree the squash with some of the stock that’s left. Once all the squash is pureed, add it to the soup pot and mix in with the rest of the warm stock. Turn on the heat, mix all together as it warms. Add butter, heavy cream, nutmeg and a pinch or two of salt and the black pepper. Mix all together. Grate a bit more fresh nutmeg on each serving before eating. Last week, a friend of mine did me a big favor. To thank her, I offered to deliver dinner to her house for her and her partner. Her only request was that there be no meat and no wheat. I said, no problem! I made a roasted red bell pepper soup and a side salad for them. It was nice to spend my Sunday afternoon cooking up the soup as thanks to my friend. Food is such a great way to show appreciation for the kindness of others. Certainly, we rely on the kindness of our friends to help us out in so many situations, none of us could do it alone, that is one thing I feel sure about. Here’s how I made the soup. Easy and delicious. Preheat oven to 375 degrees. Quarter peppers and put them in a roasting pan with the whole garlic cloves (use two roasting pans if necessary). Drizzle with olive oil and sprinkle with salt. Put in the oven and roast for apx one hour or until the peppers are good and soft and some have a nice brown skin on them. Remove from oven and put in a Cuisinart with kidney beans (you’ll probably need to do it in two parts). Put blended mixture into a pot with a bit of olive oil and 2 cups of water. Add heavy cream, a few splashes of white wine, and butter. Salt and pepper to taste and stir until it’s all well blended together. Serve with a sprinkle of fresh grated Parmesan cheese. Well, the weather has turned back to rain here in Southeast. It was a nice sunny weekend, but it just didn’t last long enough. As is pretty common in our house and I think often influenced by this rainy place we live in, I made a pot of soup. 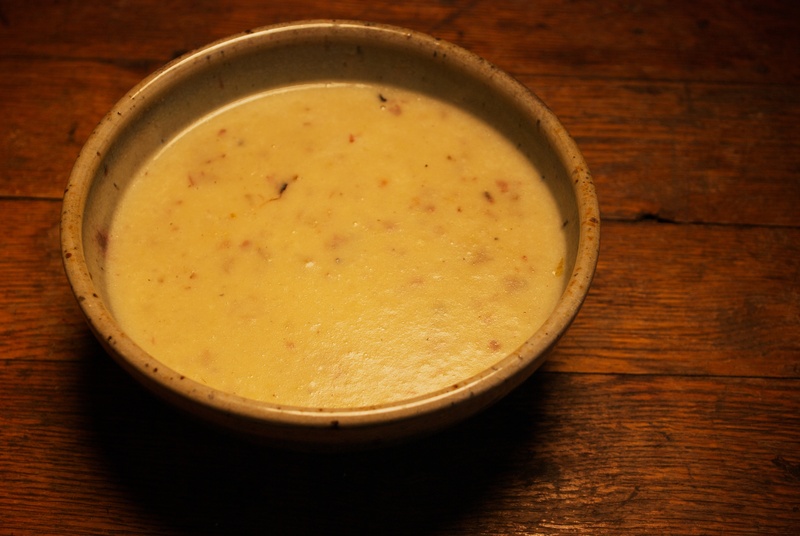 This time, roasted potato leek soup. I find this soup has a very comforting flavor and it warms up the body well when you’re chilled and somewhat discouraged by the June rains (or any other month for that matter). As is the norm for my recipes, this is a simple one although it does take some time, so if you want to eat quick, it’s probably not the best meal for immediate gratification. Firstly, I do not bother to peel the potatoes. 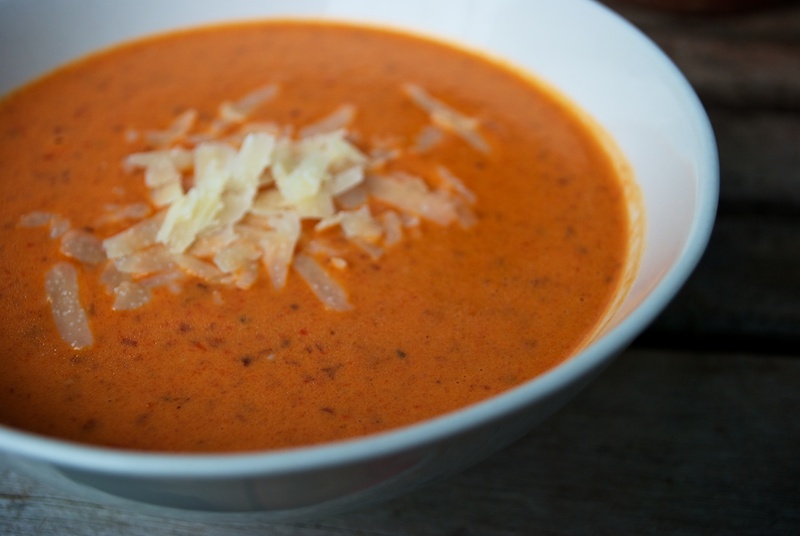 The red peels are light, good for you and add a nice texture to the soup. If I don’t use red potatoes and use any bigger potatoes with brown tougher skin, I peel them. You can peel the red if you want a smoother soup in the end. Up to you. Once the potatoes are cut up, toss them in a roasting pan. Separate the whites from the greens of the leeks, cut the whites in half and rinse them out. Sometimes the insides are filled with dirt, so it’s important to do this. Slice the leeks up and toss them in with the potatoes. Drizzle with olive oil, sprinkle with kosher salt and a good amount of black pepper. Put this all in the oven. Check every 15 minutes or so and stir around. Leave in the oven for about an hour and a half or until the potatoes are getting a nice golden brown and the onions are caramelizing and some are crispy. Take out and transfer contents to a Cuisinart and add some water, I do this in two batches. Mix until creamed together, but leave some texture. Scrape the creamy mixture into a pot and add about 4 cups of water and the white wine. Stir on medium heat until it’s all integrated. Add the cream and the butter, salt and pepper to taste. Let cook for a while longer to allow all the flavors to meld. I usually let it cook for another half hour or so. While it’s cooking you can scrape the crusty bits of salty, olive oil coated potatoes and leeks out of the roasting pan with your fingers and eat them! A perfect and delicious way to pass the time. 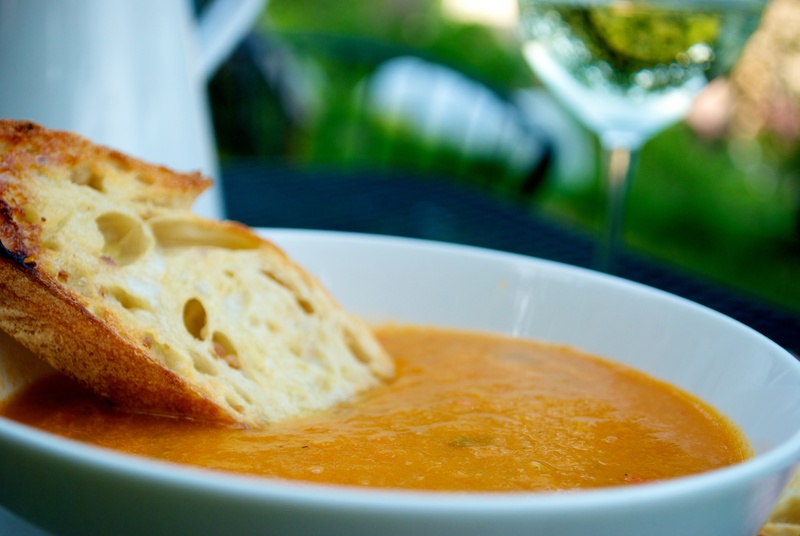 Enjoy while watching it rain, with a salad, good bread and red or white wine, I happen to think either tastes great with this soup. Well, the good news is the sun is shining in Juneau! It’s been a long and wet spring, so summer solstice arriving with sunshine was pretty much the best thing ever. Last night I had no plan for dinner. I knew I wanted to mow the lawn and putter a bit in my garden when I walked in the door from work around 6pm. So I made roasted vegetable soup, one of my favorite, easy, low stress meals that tastes good and always leaves enough for lunch the next day. I have a several variations of this soup. This is the most basic and simplest version. For our soup last night, I chopped up three bell peppers (yellow, orange and red), two zucchini, half a red onion, three cloves garlic (just cut these in half), and four medium sized tomatoes (I just sliced the bottoms of these so they didn’t explode). I tossed all of this in a roasting pan with a few sprigs of fresh thyme and drizzled with extra virgin olive oil. I added a dash each of salt, pepper and crushed red pepper (you decide how much you want depending on the amount of heat you like). I used the thyme because it’s what I have growing now, but if I didn’t have this in a pot on my porch, I would not have gone out and purchased any. The point of this meal is to use what you have. If you have fresh basil, throw some of that in (mine is still too tiny!). Whatever you like. Anyway, I put the whole thing in the oven to roast at 400 degrees. While roasting, you can mow your lawn, water the garden, gather flowers, and enjoy the sunshine! Come inside every now and then to stir it around. When the veggies seemed good and roasted, and Bret and I were both getting hungry from chores, I took them out, tossed them in a pot on the stove top, drizzled with more olive oil, and added about four cups of water and a can of Cannellini beans. The beans add a nice texture and protein. You can also mix in veggie or chicken bullion if you want, but I didn’t have that, so I just used water. 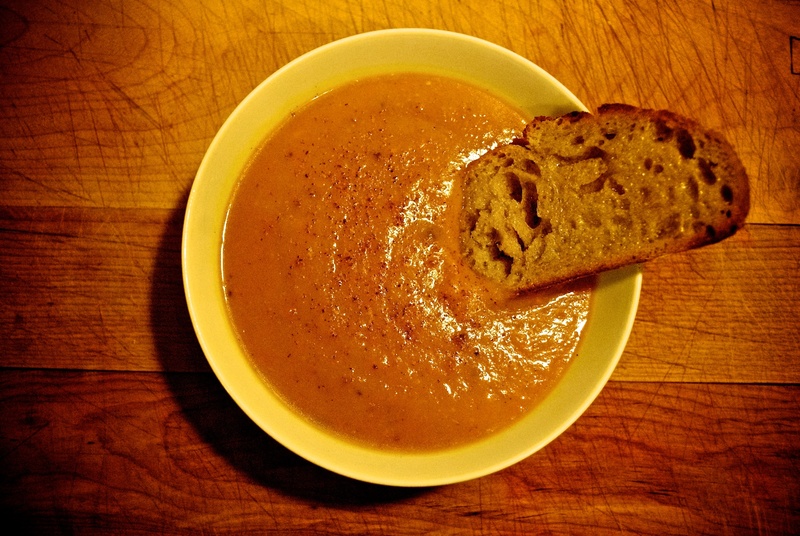 I blended it all together with an emulsion blender (referred to in our house as a “stick” blender), leaving plenty of texture (it doesn’t need to be super smooth, this is an easy rustic soup). I added a few bay leaves and some white wine and let it cook for about 20-30 minutes on medium heat. I seasoned with more salt and pepper before serving. Sometimes I add a couple tablespoons of butter at the end which is delicious. We ate with good bread, toasted and buttered while sitting at the table in our freshly mowed yard. A couple things to note about this soup; if you’d like, you can add a dollop of plain yogurt or some heavy cream when serving. Whatever you do, don’t stress out about this dish. Roasting vegetables brings out so much flavor. Try different veggies, figure out what you like best and keep those veggies on your shopping list, for just these kinds of easy dinners! As I said, I make many variations of this soup, so I am sure there will be more to come. Happy Solstice! May your summer be filled with good food, good friends and good cheer! Have a lovely weekend! 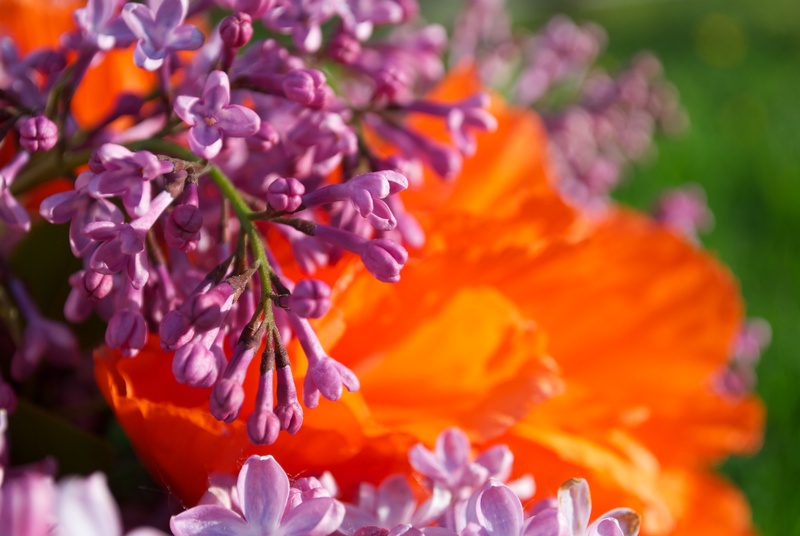 Lilacs and Poppies. Gathered from the garden while the veggies roasted.